Outside the Ontario Science Centre, an intrepid group of storm chasers looks to the sky and waits. Storm chasers — easiest described: people compelled to chase tornadoes — do what they do for a variety of reasons. Some are scientists who seek to study the way these phenomena form, in order to improve predictive techniques and advance warning times for those who live in their devastating paths. Others, like filmmaker Sean Casey, just want to get as close as possible, with the best camera possible (an IMAX), and capture some of the most amazing footage you’ll ever see. Because, you know, why not? If you’re planning on travelling inside a tornado, you’ll have to fulfill a couple of minimum requirements. First, it should go without saying, is having a gigantic pair of balls. To carry said balls, likely weighing several orders of magnitude above an average man’s, you’re going to need a gigantic vehicle. This is where the TIV comes in. 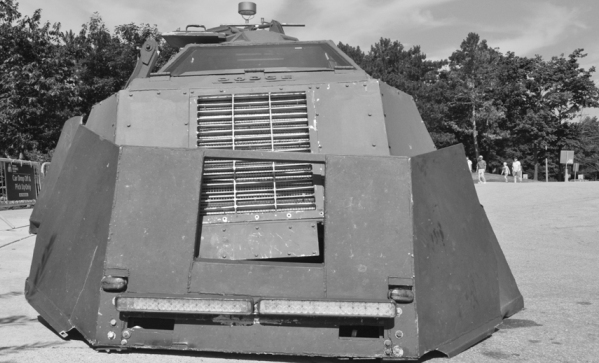 The Tornado Intercept Vehicle is a custom-built behemoth — by “custom-built,” we mean Casey pretty much built the thing himself — fully capable of venturing into the eye of the most violent storms. Using a modified 1997 Ford F-450 pickup platform, the TIV weighs in at approximately 16,000 pounds — just about double your stock F-450. Reinforced with composite armour forged from layers of steel, aluminum, Kevlar and polycarbonate, this ten-wheeled, six-axle monster is anything but subtle. Which only makes it more fun to ride in, as the TIV’s 625-horsepower 6.7-liter turbo diesel propels it out of the Science Centre driveway. July in midtown Toronto isn’t quite prime tornado-hunting territory. The air is stagnant and hot as the electric buzz of cicadas drones over traffic on Don Mills Road. Pushing 30°C, the sun beats down, unmitigated by the lacy white wisps of clouds that promise little in the way of relief. That doesn’t mean we can’t intimidate the hell out of East York drivers and remind every guy behind the wheel of an H2 that he purchased a glorified Tonka truck. The complete absence of seat belts (because, why?) lets you know that the TIV is the real deal. Riding shotgun, six hydraulic steel stakes glimmer in the sunlight: When intercepting a tornado, they plunge forty inches into the Earth which, along with six steel skirts deploying downward to deflect wind, keeps the TIV rooted to Terra Firma. Though we urge Casey to haul the TIV down to Queen Street just to see how many cyclists’ heads would explode, our tour takes us along Don Mills and gives us ample time to check out the TIV’s DIY instrument panel and IMAX turret. Yup, even the camera mount is badass. With a design taken straight out of the Millennium Falcon, it houses a 70mm IMAX camera that captures the images seen in Casey’s documentary film Tornado Alley. Images that are, in a word, incredible. Narrated by world-renowned tornado expert Bill Paxton, Tornado Alley doesn’t need flying cows or Helen Hunt in a wet t-shirt to grip your attention. The sheer majesty of nature — described by Casey as almost otherworldly — is simply beautiful. While we ride with Casey for only a quarter of an hour, his abiding love and respect for what he has witnessed is consistently, constantly clear. Sadly, the ride was over almost as soon as it began. Sincere thanks to Casey for letting three gangly journalists tag along in his custom ride, despite the fact that doing so left very little room for his tremendous, uh, ego. And, at roughly 8 MPG, we’re thankful he didn’t make us chip in for gas. If you ever find yourself cruising along and happen to spot an ominous funnel cloud, take a moment and go over this handy checklist before deciding whether to flee or follow. If you answered “No” to any of the above questions, you’re probably better suited to be a storm watcher than a storm chaser, in which case, Tornado Alley beats Twister, The Weather Network and The Wizard of Oz any day of the week. Tornado Alley is now playing at the Ontario Science Centre Cinesphere. Images courtesy of John Spence.